One of Blantyre’s most iconic features is the Livingstone World Fountain. 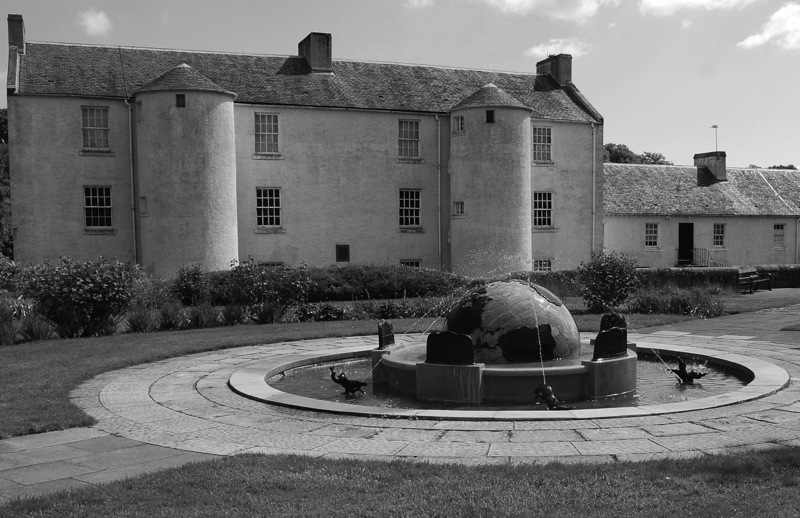 So many times i’ve been to David Livingstone Memorial site and walked by the globe in the little circular pool and simply thought “nice fountain“. Stopping recently to have a real good look, I quickly gained a new appreciation of the craftsmanship put into it. So, in true keeping with wanting to know more, Blantyre Project headed off to uncover the history of the fountain and find some more information. The Globe itself is officially known as “The World Fountain“. It was gifted by a Mrs Maxwell to the Livingstone Memorial Trust in 1928, just prior to the site opening. Mrs Maxwell was the wife of a well known local 1910’s Councillor A. Maxwell. Designed by the Trust’s Architect, Mr F Mears and erected by Mr C. ‘O Pilkington Jackson, the globe of the world is made from quality marble and bronze. I was surprised to uncover a lesser known fact from the 1929 opening programme that the world fountain is orientated in such an exact position that it becomes a huge sun dial. It is so exactly sited, that when the sun shines on it, it displays what countries that are actually currently lit in sun. This effectively makes it not only a work of art, but something of general geographic interest. The sundial was commonly known by children when the monument opened, but seems to be lost now to the current generation of visitors. The five points on the globe, ie the plaques and little statues, depict the simple industries by which mankind (and womankind) lives. More on this later.